We've been suffering the first real cold of the season, with it being my turn last week and M's this week, which means we've not really been able to take advantage of 'half-term' activities. M was well enough to attend a friend's Hallowe'en party earlier this week, but otherwise poor M hasn't felt up to much, so was keen to go to the community allotment yesterday. Disaster struck a few minutes after we arrived when M moved some stacked garden chairs which had been rained on. Unfortunately the rain had pooled in the bottom chair on the stack, so when M picked up the last two chairs she tipped a sizeable puddle onto her legs and into her wellies. Fortunately, M took it in good humour as I sat her down and poured the water out of her wellies while she inspected her soaked trousers and sodden socks. After a brief check to see if there were any spare clothes/wellies on site, we went home so M could change but were back half an hour later. 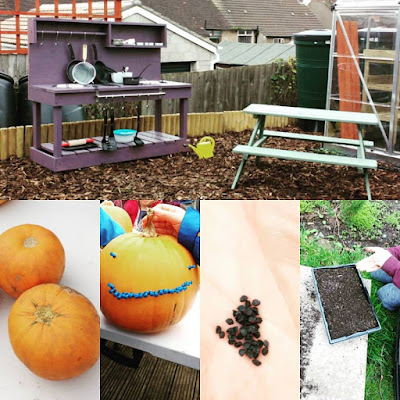 M immediately got stuck in with planting beans, decorating a pumpkin with pins (we'll carve it over the weekend), saw onion seeds for the first time and helped set up a new mud kitchen. We ended up staying an hour past the end of the session so M could help test the mud kitchen thoroughly, before we headed home with a happy girl. An afternoon at the allotment. 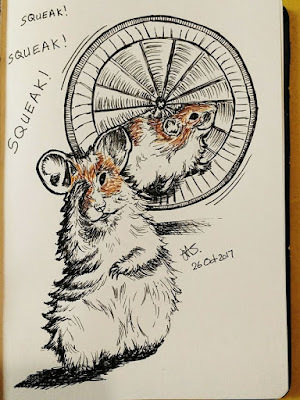 Inktober continues here and yesterday's prompt was 'Squeak'. 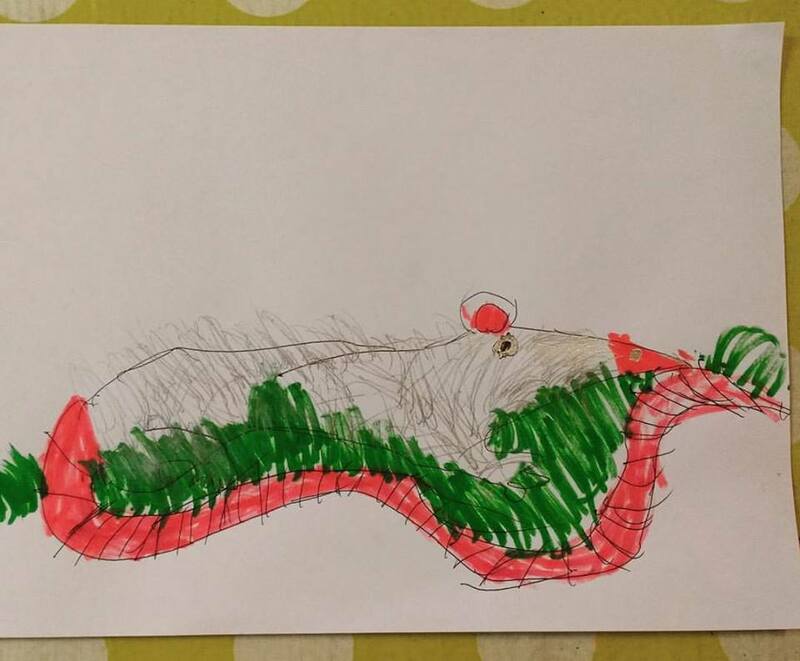 M elected to draw a very big mouse. While I decided on hamsters. My drawing for #inktober2017 Day 26 - Squeak! Dave drew our cat Missy because she came up to him as he was staring at his sketchpad and squeaked to get his attention. No photo though, as it isn't mine to share.